Sophie is currently a high-school senior at The Winsor School in Boston. She started her food blog, @eatgooodfood, on Facebook and Instagram in her freshman year of high school and has since enjoyed sharing and reviewing food from all over the world, and engaging with the communities and people that her blog has allowed her to connect with. When not eating or posting about eating, she loves to play her saxophone or take photos. 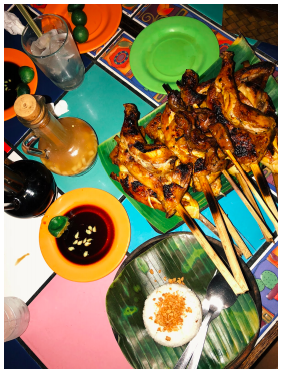 When I first started thinking about this post, I wanted to speak to the cultural and generational gaps I have experienced as a Filipina­ American who is growing up in the US and who visits the Philippines each year. However, my personal evaluation of my family members living in the Philippines sounded more like complaints and frustrations rather than a coherent post. So, I tried again. Fresh off my most recent annual trip to the islands and fighting off jet lag, I wrote down my thoughts on some of the gaps I see between my experiences in the US and in the Philippines. Ever since I can remember, I have always loved to travel. I love to try different types of food, learn about other cultures, and meet new people. But when it comes to experiencing new places that are also supposed to be quite significant to one’s identity, it’s a little different. For me, I get caught between seeing Filipino culture as an outsider and inheriting this culture as my own given Filipino ethnicity. Here are a few examples. My Lola (grandma in Filipino) has been retired for at least 25 years, meaning she hasn’t practiced pediatrics in almost three decades. Nonetheless, people who know that she was a doctor, will always greet her with “Doctora” (doctor in Filipino). Likewise, if you were a lawyer, you are greeted as “Attorney” and if you were a Justice, you are greeted as “Judge.” Here in the US, at least in my experience, I’ve witnessed these terms used only to reference someone who is still practicing, and only in situations where the title seems relevant, such as when greeting a clinician in their office. In the Philippines, these terms are used partly out of respect and partly due to the high importance that many Filipinos associate with one’s accomplishments and titles. While in the US, a ­retired doctor may not be greeted by that title by just anybody, you may encounter teachers with PhDs that ask their students to call them by “Dr.” and even more often you may see the convention of listing degrees after one’s name on business cards or email signatures. So, maybe the obsession with titles is not all that different? Now, try this situation. It’s lunchtime in the Philippines. You’re heading into a mall because when you’re in Quezon City or Metro Manila that’s really where most people hang out and eat. First, you notice a number of police officers with guns. Yes, armed guards in front of a shopping mall. Next, you get in a line for a quick security scan or pat down and open your bag for the guard to check it. Nope, we’re not at the airport, still at the mall. During all this, you’re thinking, “Wow, that was quite a lot of security just to enter a mall,” while also thinking, “Well, that was some pretty lax security.” In my experience, the armed guards are more likely to open the car door for you or offer an umbrella to shield you from the rain than they are to use their guns. The security scan or pat down barely covers your back, and there’s no need to unzip your bag fully for the bag check. 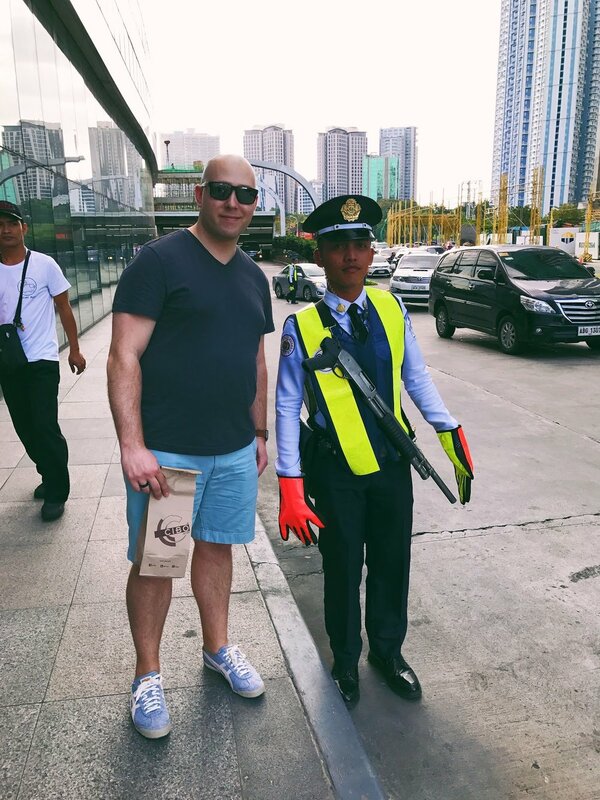 I’ve been told that this greater presence of police and security is just for show, and it’s easier to pull off in the Philippines because people are cheaper to hire. 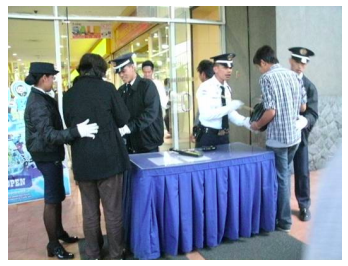 Armed guards at mall entrances may not be what you are used to in the United States, but you’d be surprised how quickly you get used to them in the Philippines. At this point, you’re walking around inside the mall. You look to your left, and you look to your right. Each and every restaurant that you pass will have an employee outside their respective establishment saying, “Good afternoon, po / Ma’am / Sir!” Again, you have these titles that reinforce the significance of hierarchy in Filipino culture. Appending “po” in a sentence is meant to show respect, while the titles “Ma’am,” and “Sir” are used out of respect, but more importantly, as an acknowledgement on the employees’ part that their job is to serve you. On the flip side, you may hear customers call for waiters by saying “Boss” instead of “Excuse me” as one may say in America. Although the waiter is obviously not the “Boss” of the restaurant, many Filipinos use this title as a way to “butter up” the waiter before they serve them. Similar exchanges in the US don’t often involve these explicit titles, but certain American manners and customs, like a waiter saying, “Hi, my name is [insert name] and I’ll be serving you today!”, may have the same effect as the titles. Lastly, a little on societal standards of beauty in the Philippines. Given that the Philippines is a very sunny place, it’s much easier to get a tan there than it may be in many parts of the US. And most Filipinos are just born naturally tan. However, Filipino stereotypes suggest that if you are darker, you must work on a farm or belong in a lower socio-economic class. So a lot of Filipinos aim to be whiter and paler. Interestingly, the craze in America is always about getting tanner. If you’re not tan, you didn’t go on a leisurely and expensive vacation to a sunny island. In a way, skin whitening cream in the Philippines could be paralleled to fake tanner in America. One always wants what they can’t get. I’ve tried to make sense of my Filipino and American cultures in a way that makes them seem not so different. While I know that they are unique in their own ways, it can be comforting to see their similarities as I grow up trying to understand and balance the two. I love them both / mahal ko silang kapwa! It's the ambiguous melanin. The Spanish surnames. But most of all, the English. This, I think, is why it's so hard to track Filipinos down, especially when we're not congregating in an enclave like those in California or New Jersey. We're self-reliant because we're not speechless in this place; even recent immigrants come with a firm grasp of the English language. Those who do are lucky. English speakers are much less common in poor and rural areas. I grew up in Metro Manila with parents who taught me both English and Filipino at home. Nevertheless, English is a co-official language of the Philippines, and many of us speak it in addition to one or more regional languages. In this sense it's surreal—and offensive, in professional circles—when people exclaim “your English is so good!” First of all, I’m a native speaker. Secondly, the Philippines was an American colony for decades, ceded from Spain for a cool $20M back in 1898. Finally, this may mean that people have ideas about What Native Speakers Look Like, and that I don’t look like that. I won't pursue that train of thought. It’s more constructive to share the ways we remix and play with this language - the ways we make it our own. Code-switching, or adapting your speech to build rapport with different groups, has a wide spectrum when you speak two or more languages. In Manila, that can look something like this: English with an American accent, when you’re at a call center talking to Americans at midnight. English with a Filipino accent, if you want to sound educated but approachable. You might switch to Taglish, if you ran into some people from high school and that’s how they speak. You may also toggle back and forth between multiple regional languages depending on where you are. Here, for example, are some words for “love” that differ wildly from language to language: mahal, langga, gugma, boot, ayat, hirang. In the Philippines, you’ll find a proverb like “every cloud has a silver lining” transformed into its gallows humor doppelgänger, “every cloud has a silver lightning.” Whether it's intentional wit or a misheard phrase, who knows? But we’ve been known to embrace our misheard English too, with expressions like “what do you take me for, granted?”—a combination of “what do you take me for, a fool?” and the idiom “to take for granted." Bilingual punning is rampant, often leaning heavily on English words said in a Filipino accent, or English words with a phonetic sound that translates to something else in Filipino. Ako wala = A koala. We also love our acronyms. “N...P...A? Nice People Around?” quips Imelda Marcos in Jessica Hagedorn’s novel, Dogeaters. NR, or No Reaction, is something you might call your most deadpan friend: “That’s so sad. Aren’t you sad?” “I am sad. This is my sad face.” “Wow, you’re so NR.” The Tagalog opposite of that, by the way, is KSP, "Kulang Sa Pansin,” a person acting out because they're starved for attention. Speaking and teaching English is big business in the Philippines. There’s a massive population of young people who speak fluent, lightly accented English, which is why so many American companies outsource work to Filipino call centers. The country has become the call center capital of the world, generating about $25B in revenue. Can't you just take a compliment? Learn a more about Christine on our About page.